Artwork details: gouache, 8 x 8 inches (20 x 20 cm), 2004. Well, I'm not at all convinced that this is very useful advice, I mean it just wouldn't work - think about it: How much difference do you think the length of even a really long spoon is going to make to a creature who can reach across the vastness of Hell and pluck a single wriggling soul from the inferno? 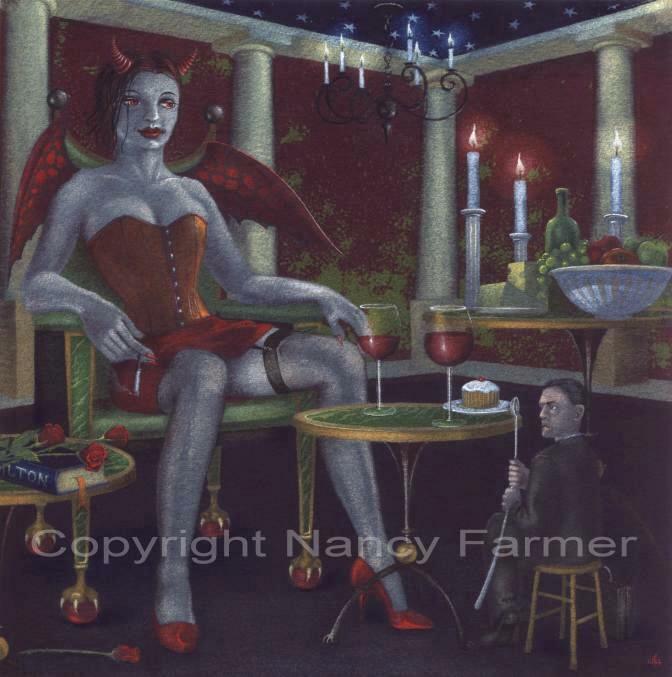 'The Devil, a Long Spoon, and a Serious Error of Judgement' - painting by Nancy Farmer. Still, here is one fellow who thought he'd try it - here he sits with his briefcase (presumably containing what he believes to be a watertight contract that he hopes his new 'friend' will sign) and, taking no chances he's made sure to get an extra-long spoon (much good that's going to be with the cake she's given him). And he's just beginning to realize his mistake... rather too late, I fear.